"The hand-built Boswell 00-14 sparkles with refined tone and articulation." 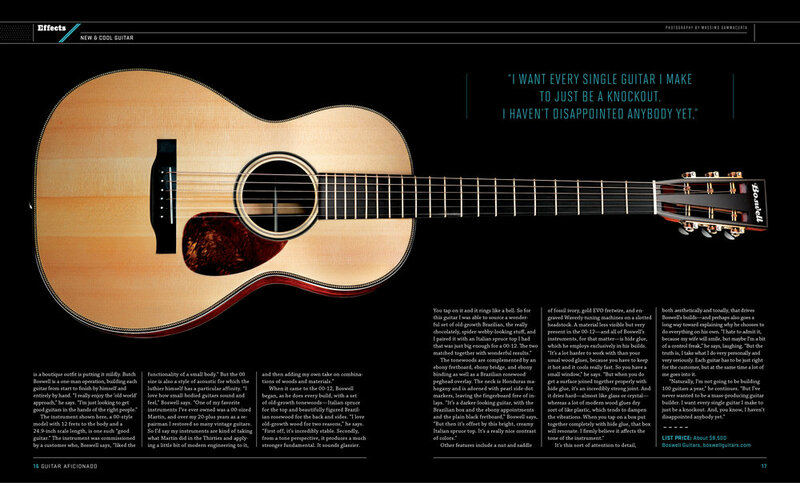 The Boswell 00-14 reviewed in the March issue of Acoustic Guitar Magazine. Click the link below to read the review, and watch the video. "Butch Boswell, a self-proclaimed "wood junkie", is taking his 20 years of guitar repair skills and putting them toward building one-of-a-kind instruments that cater to his clients' individual needs. Boswell builds guitars in small batches of two or three instruments at a time at his shop in Bend, OR. In a former life..."
"Butch is doing his own thing in the world of custom solidbody electrics, and given this guitar’s awesome craftsmanship, sweet playabilty, and wealth of sounds, the BG-R is just the kind of guitar that players looking for something unique in the high-end market should check out." "Butch Boswell wants every guitar he builds to be a knockout." Steve, pictured here with his Boswell OM-Cutaway, with Madagascar rosewood back/sides, and an Adirondack top. “When I got my Boswell, it quickly became the acoustic guitar I use for recording 90 to 100% of the time. It's hard to put into words, but there's a certain balance to the tone. 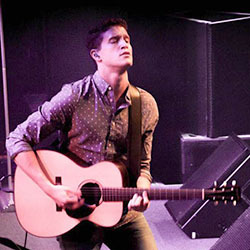 “First of all I have three Boswell guitars, two acoustics and an electric, so I am obviously a fan! Butch's handmade acoustic guitars are extremely special. He has access to the finest sets of wood you will ever see, and his attention to detail and craftsmanship are extraordinary. But most important of all of course, is the sound and playability...phenomenal! The evenness and purity of tone are perfect, and the sound has a three dimensional quality, as if you could walk around in it and touch it below you and above you! These guitars are capable of any musical range you can imagine, like a fine Steinway piano, and the recording microphone loves them. 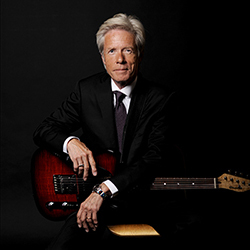 "As a musician, Danny has performed and recorded with Carole King, Diana Ross, Tower Of Power, Eric Clapton, Melissa Manchester, and many others. As a composer Danny Pelfrey has won two Emmys (nominated nine times), six BMI awards, and a Video Premiere Award. He has been the score composer for numerous television shows including American Dreams (NBC), Spin City (ABC), Felicity (WB), That's Life (CBS), Strong Medicine (Lifetime), Guiding Light (CBS), and many others. He also composed the score and produced the songs for DreamWorks' Joseph King of Dreams, as well as over 50 interactive game titles including the Star Trek series for Activision. His concert works have been performed by the Knoxville Symphony, the L.A. Jewish Symphony, and the National Symphony Orchestra. He has shared concert programs with John Williams, Elmer Bernstein, Andrew Lloyd Webber, Igor Stravinsky, and Charles Ives. His compositions and arrangements for broadcast media can be heard in most major markets domestically and around the world. “My name is Danny Weis, and I have been a professional guitarist for over 50 years. I am the co-founder of the Iron Butterfly. In addition, I have recorded/toured with many artists including Lou Reed, Alice Cooper, Bette Midler (in the movie: the Rose), The Rascals, The Everly Brothers, Burton Cummings and many more. Butch Boswell has become my only go-to guy for all guitar work. I trust him implicitly with all of my guitars. His acoustic guitars are incredible. Rich, warm tone, with great projection and wonderful feel and playability. Recording and/or performances w/ Bobby McFerrin, Bo Diddley, Ella Fitzgerald, Nelson Riddle, Henry Mancini, The Boston Pops, Don Menza, Bob Sheppard, Burt Bacharach, BJ Thomas, Natalie Cole, Billy Vera and the Beaters, Timothy B. Schmit and many others. Tim Bluhm is an American songwriter, producer, multi-instrumentalist, singer, and musician currently residing in California. He has performed solo, in addition to being singer/guitarist and primary songwriter for the rock band The Mother Hips(MotherHips.com) . He is part of the duo the Skinny Singers with Jackie Greene, and is a member of The Rhythm Devils(featuring The Grateful Dead's Mickey Hart and Bill Kreutzmann), and Ball-Point Birds (with Hips co-founder Greg Loiacono). Bluhm has also performed with or opened for Johnny Cash, Wilco, The Black Crowes, Widespread Panic, Lucinda Williams, M. Ward, Cracker, John Hiatt, and Phil Lesh. 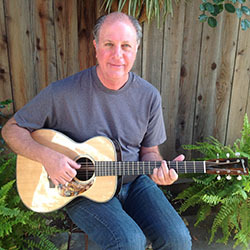 "My Boswell dreadnought is everything I always wanted from a large acoustic guitar. It has a balance that I’ve never experienced in any other guitar, a consistency of tone, volume and action across the fretboard that is extremely rare in my experience. Aesthetically it is superior to any guitar I’ve ever played. The attention to detail, the craftsmanship and the wood selection are all exquisite. I’ve known Butch for many years and I am aware of the depth of his experience as a repair expert and as a luthier. Any guitar that Butch hands me is going to be a beautiful sounding, playing and looking instrument." - Tim Bluhm. Tim Bluhm with his Brazilian rosewood back/side, Adirondack top model D.